In November 2006, Matcon IBC were awarded a contract for the supply of the Materials Handling System for Chek Hup. Chek Hup Sdn. Bhd is located in Ipoh, Malaysia and was established in 1960 specialising in rock sugar processing. 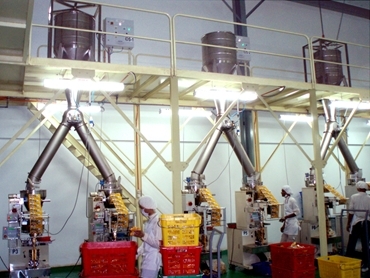 In the 90's Chek Hup introduced the manufacturing of 3 in 1 Ipoh White Coffee, a unique recipe developed by Ipoh coffee roasters more than 50 years ago. The Chek Hup brand is in 15 countries and is well known for its quality, robust aroma, smoothness and rich taste. Matcon used their regional experience in 3-1 powder processing to implement a Smart Drum IBC (Intermediate Bulk Container) system of 300Litre capacity. The Smart Drum system is a closed system in which the batch is contained in a sealed IBC. Each Smart Drum IBC incorporates Matcon’s cone valve technology, which is used to provide the necessary controlled feed into the packaging lines without the risk of segregation of the 3-1 after blending. The IBC system is a modular approach, which can be added to later, Chek Hup saw this as a distinct advantage as this will fulfil their future expansion plans. The IBC system is a closed transfer system and prevents the risk of contamination i.e. operators exposure to air borne dust or therefore improving the Health & Safety issue contaminate getting out) considerably. Also the IBC system prevents contamination of product quality which a GMP issue (contaminate getting in).